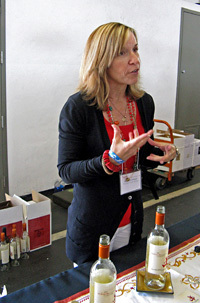 Report on the 5th Annual Grand Wine Tasting presented by TAPAS (Tempranillo Advocates, Producers, and Amigos Society), on Sunday, June 9th, 2012, at the Festival Pavilion at Fort Mason in San Francisco, California. The event features the most extensive annual tasting of US-produced wines made from Iberian grape varieties. 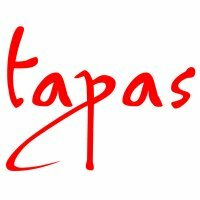 TAPAS is a non-profit trade association formed in January 2006. The group’s stated mission is “to promote Tempranillo and other varietal wine grapes native to the Iberian Peninsula, and wines produced from them in North America.” A total of 35 different grape varieties are currently recognized by TAPAS. In addition to the annual tasting in San Francisco, the organization also promotes International Tempranillo Day (November 8th this year) and the inaugural International Albariño Day (August 4th this year) to celebrate those two varieties. They’ve also developed the “Nuevo Spanish Wine Trail” – a route that links the member wineries through the western US. There are currently about 90 members of TAPAS, located in California, Oregon, Washington, Arizona, and Texas. As with past TAPAS events, this tasting offered a wonderful opportunity to sample domestically-produced wines made from Spanish and Portuguese grape varieties in one setting. There were over 45 wineries pouring at this year’s Grand Tasting, from all over California, plus a handful from Arizona, Oregon, and Texas. The number of wineries has grown with each event, and this year it was large enough to make the move from Fort Mason’s Herbst Pavilion to the larger Festival Pavilion. In addition to the tasting, there was a silent auction during the event, with proceeds to benefit various TAPAS programs and projects. Because of the larger event space, it was tough to tell whether the crowd was larger than last year. But there’s no question that this event has become quite popular in just a few short years, and the turnout for the Grand Tasting was certainly a good one. Tables in the pavilion were spaced nicely, so there were few that were overly crowded, something that had been an issue in the smaller event spaces used in past years. As usual, TAPAS augmented the winery tables with a variety of enticing foods at many locations throughout the pavilion. 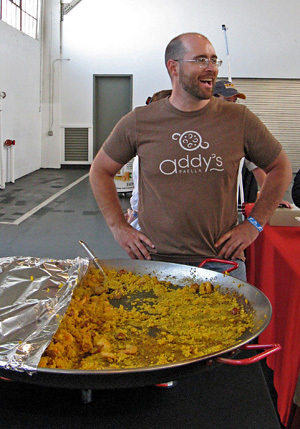 The huge paella – served up this year by Addy’s Paella of Lodi – was once again a big hit. As I noted last year, this tasting continues to improve in its organization and efficiency, and everything ran very smoothly from beginning to end. TAPAS Executive Director Heidi Stine, her staff, and the many volunteer helpers did a fine job of planning and running the Grand Tasting. As I’ve mentioned in the past, it helps to know your grape varieties at this tasting. Between some varieties being labeled with their Iberian names vs. generally more familiar French names (Garnacha / Grenache, Monastrell / Mourvèdre), and Spanish vs. Portuguese names for the same varieties (Tempranillo / Tinta Roriz, Albariño / Alvarinho), it can be confusing to consumers as to what’s in the bottles. I’ve also noted before that since the TTB – the federal agency that regulates wine – does not yet recognize some Iberian grape varietal names, room for more confusion exists. While there will probably remain some differences in how these varieties are labeled, it would be good to see more consistency and clarity in the naming of these grapes among TAPAS member wineries in the future. As always with larger tasting events, I was not able to get to all the producers I would have liked to. I’d hoped to taste the wines from the Arizona and Texas producers pouring at this year’s tasting, but didn’t make it to their tables. And for the first year, I ran out of time before I was able to make a last pass through some of the wineries to taste their Port-style and other dessert wines. As is sometimes the case at these events, I probably spent too much time talking with the winemakers and other people there – that’s always fun and often enlightening, but it does cut down on my tasting efficiency! Still, I did manage to get to a few wineries this year that were new to me. Although I came across a handful of the same wines that were also poured last year, most wines were new releases. There were also previews of a few not-yet-released wines, and we tasted one older vintage that was being poured as well – thanks to Truchard for always generously pouring one of their library wines! I tasted with Grape-Nutz colleague Al Osterheld again this year, and as at the past few wine events, we did not attempt to taste whites first and go back afterwards for reds – we just took everything as it came at each winery table (with the exception of the sweet wines). I’ve felt that the wines poured at the TAPAS tasting have improved from year to year, although I didn’t think there was much notable difference in wine quality between this tasting and last year’s. I did feel that last year’s wines were quite good, so that’s not necessarily a bad thing. And while that observation may be at least partly a factor of which wines I tasted out of the many being poured, it would hardly be surprising to see something of a plateau for wine quality at this point from these grape varieties. After all, many of the wineries are relatively new to making wines from Iberian varieties, and there is sure to be some learning involved, both on the grape-growing and winemaking sides of things. There is clearly potential for better and more consistent wines, and I have no doubt that we’ll see this potential realized in the years to come. In the meantime, it was no surprise to me that many of my favorite wines at the event came from the handful of producers who are well-known leaders with Spanish and Portuguese grape varieties – Abacela, Bokisch, Quinta Cruz, and Verdad in particular. In addition, favorites came from wineries that are either lesser-known or are known more for other types of wines – Core, Dancing Coyote, Forlorn Hope, Longoria, Pierce Ranch, and Truchard are among these, and they’ve been consistent performers at the TAPAS tastings. Not too many wines I tasted from the newer producers pouring at this event impressed me a great deal, but there were a few good ones. The most notable newcomer (if you can really call him that!) 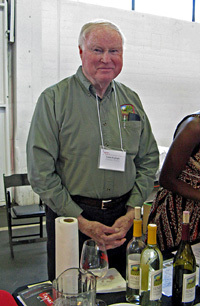 was Kenneth Volk, whose passion for the more obscure grape varieties in California is legendary. Some of the more interesting varietal bottlings I tasted this year were from Touriga and Graciano – two grapes that I think have a bright future here, judging by the examples I tasted this year and last year. And I also tasted for the first time a couple of varietal Souzão bottlings and a varietal Tinto Cão – both varieties better-known for going into Port-style dessert wines. Also of note this year were the number of varietal Tempranillos that I thought were noteworthy – in past years I’ve preferred blends to the varietal bottlings. There were a number of fine white wines on display as well, with Albariño and Verdelho leading the way, but also some nice Garnacha Blanca and Torrontés bottlings, plus a few very good Rosés. As I found last year, there seemed to be a real sense of excitement about these wines, both among consumers and among the producers themselves. Many of the wineries pouring at the TAPAS tasting can rightly see themselves as true pioneers of Iberian grape variety wines in the US. It’s entirely possible that the growth ahead for these wines could parallel what we saw with Rhône grape variety wines in the US when they were at a similar point 20-25 years ago. They may not ever overtake the Chardonnays, Cabernets, and Pinots of the American wine scene, but I believe they have the potential to move beyond being just a small niche in the market. I’m looking forward to following these pioneering vintners and their wines in the coming years. Abacela 2011 Albariño, Estate, Umpqua Valley, Southern Oregon. Made entirely in stainless steel. Light color, with fresh apple, pear, and mineral aromas. Fairly light on the palate with very lively acidity and a crisp finish, nice. Abacela 2011 Grenache Rosé, Estate, Umpqua Valley, Southern Oregon. Destemmed and left about 18 hours on the skins before pressing. Light pink color, this displayed fresh strawberry and grapefruit, and a touch of spice. Bright mouthfeel with a clean, refreshing finish, nice. Abacela 2009 Tempranillo, Southern Oregon. From Clone 2, planted in gravelly soil. Medium color, with ripe red fruits and plum, earth, and pepper on the nose. Medium-bodied with moderate tannins. Abacela 2008 Tempranillo, Estate, Umpqua Valley, Southern Oregon. Aged in about 25-30% new French oak. Less fruit-forward than the previous wine, this showed more earthy, peppery, and smoky notes along with blueberry and darker fruit. Structured and fairly tannic, this should age nicely. Abacela 2007 Tempranillo, Reserve, Umpqua Valley, Southern Oregon. From 100% Estate fruit, about 30% new French oak. Medium-dark color, with more spice character along with higher-toned fruit and a touch of vanilla/oak. Bigger on the palate with grippy tannins on the finish. Abacela 2005 “Paramour,” Estate, Umpqua Valley, Southern Oregon. Mostly Tempranillo with a little Petit Verdot, aged nearly two years in about 30% new oak, then bottle-aged four years.Medium-dark color, with earthy plum and darker fruit aromas, plus spice and undertones of vanilla/oak. Richer mouthfeel with big but more refined tannins. Comments: The Abacela wines have been particularly impressive the past couple of years at this tasting. Baiocchi 2011 Rosé, “Neophyte,” Baiocchi Family Vineyards, Fair Play. From 70% Grenache, 30% Mourvèdre. Light salmon/pink color, showing red fruits, earth, and a touch of spice on the nose. Medium-light weight on the palate with a lively texture and smooth finish. Baiocchi 2010 “Orellana,” Baiocchi Family Vineyards, Fair Play. 60% Tempranillo, 40% Grenache, just bottled. Medium color, with earthy plum and black cherry fruit, baking spices, and dried herbs. Medium-bodied with a fairly grippy tannic finish. Baiocchi 2009 Grenache, “Entre Nous,” Baiocchi Family Vineyards, Fair Play. 90% Grenache, 10% Syrah. Medium purple color, this displayed riper red fruits, and black pepper aromas plus a touch of spicy oak. More structured in the mouth with chewy tannins. Bokisch 2011 Garnacha Blanca, Vista Luna Vineyard, Borden Ranch-Lodi. 87% Garnacha Blanca, 13% Albariño, made entirely in stainless steel. Very light straw color, with bright apple, pear, and spice aromas along with a touch of lees. Medium-light weight in the mouth with a lively texture and crisp finish, nice. Bokisch 2011 Albariño, Terra Alta Vineyard, Clements Hills-Lodi. 80% Albariño, 20% Garnacha Blanca, made entirely in stainless steel. Very light color, this showed stone fruit and citrus scents with a slight briny note. A bit bigger on the palate than the Garnacha Blanca, with nice acidity and a clean finish. Bokisch 2011 Rosado, Terra Alta Vineyard, Clements Hills-Lodi. Made from Garnacha and Barbera. Light salmon/pink, featuring red fruits, a hint of lees, and lots of spice. Medium-light bodied, with a fairly smooth finish. Bokisch 2009 Tempranillo, Liberty Oaks Vineyard, Jahant-Lodi. 90% Tempranillo, 10% Graciano. Medium color, with plum and black cherry fruit, dried herbs, and vanilla/oak aromas. Medium-bodied and lively, with moderately big tannins. Bokisch 2009 Graciano, Las Cerezas Vineyard, Mokelumne River-Lodi. 95% Graciano, 5% Tempranillo. The 2009 is actually sold out and the 2010 was being bottled the week after the tasting. Medium purple color, with earthy and floral aromas along with darker berry fruit and spice. Medium weight on the palate with good structure but fairly refined tannins. Very distinctive wine, quite nice. 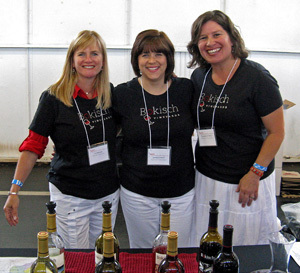 Comments: Liz Bokisch was on hand to pour the Bokisch wines, which had another strong showing at the TAPAS tasting. They continue to be among the top growers and producers of Iberian grape variety wines. Core 2010 Grenache Blanc, Santa Ynez Valley. Sourced from Camp 4 Vineyard. Very light straw color, this featured ripe apple fruit along with a slight petrol note. Medium-bodied with a fairly smooth mouthfeel and finish. Core 2008 Grenache, Santa Barbara County. 85% Grenache, 15% Syrah. Medium color, showing higher-toned ripe red fruits and spice on the nose. Fairly light-bodied and smooth, with milder tannins on the finish. Core 2008 Grenache, Santa Barbara Highlands Vineyard, Santa Barbara County. 100% Grenache, 15% whole-cluster fermentation, aged 35 months in larger cooperage. Medium-light color, with bright ripe red berry fruit, a touch of earth, and lots of spice. Bigger on the palate than the previous wine, with good structure and grippy tannins. Core 2007 “Ground Around,” California. 41% Tempranillo and 25% Syrah from Santa Barbara Highlands Vineyard, 23% Tempranillo from Laetitia Vineyard, 18% Grenache from Alta Mesa Vineyard. Medium color, displaying ripe red and black fruit with touches of earth, spice, and oak. Fairly big and structured, with a tannic finish. C³ 2007 Tempranillo, Laetitia Vineyard, Arroyo Grande Valley. Aged 52 months in 50% new French oak. Medium color, this featured plum and blueberry fruit, tobacco, pepper, smoke, and vanilla/oak aromas. Big and firmly tannic, this wine deserves time in the cellar to mellow out, but should age nicely. Comments: Dave Corey poured wines from both his Core and C³ labels. The reds are seeing more barrel aging to make them more approachable upon release, but they can still benefit from some aging. Matchbook 2011 Rosé of Tempranillo, Dunnigan Hills. Made from 80% Tempranillo, 12% Syrah and 8% Malbec. Light salmon/pink color, featuring higher-toned red fruits and spice. Medium-bodied with a smooth texture and finish. Matchbook 2009 Tempranillo, Dunnigan Hills. 87% Tempranillo, 9% Graciano, 4% Cabernet Sauvignon. Medium color, this showed ripe plum and blueberry fruit, baking spices, and lots of vanilla/oak. Medium weight on the palate with a round mouthfeel and moderate tannins. Matchbook 2007 “Tinto Rey,” Dunnigan Hills. 44% Tempranillo, 36% Syrah, 13% Cabernet Sauvignon, 5% Graciano, 2% Petite Sirah. Medium color, with earthy black cherry and plum, dried herbs, spice, and a touch of black pepper. This was more lively in the mouth than the Tempranillo, with better structure and some firm tannins on the finish. Comments: Matchbook is one of several labels from Crew Wine Company. The “Tinto Rey” bottling was my clear favorite of their three wines, and it was quite tasty. Dancing Coyote 2010 Albariño, Clarksburg. Very light straw color, ripe apple and stone fruit along with a distinctly briny component. Medium-light weight on the palate with refreshing acidity and a lively finish, nice. Dancing Coyote 2011 Verdelho, Clarksburg. Very light color, this displayed ripe stone fruit and tropical fruit, lees, and a slight minerally note. Medium-bodied with a more viscous texture but with good acidity and a fresh finish. Dancing Coyote 2010 Tempranillo, Sierra Foothills. Medium-dark color, with dark berry fruit and lots of spice. Big but lively on the palate, with a grippy tannic finish. Comments: Both whites are made entirely in stainless steel with no malolactic fermentation. Dancing Coyote wines continue to fly under the radar but they have been impressive the past few years, particularly the white wines. Fenestra 2011 Verdelho, Silvaspoons Vineyard, Lodi. Very light straw color, with ripe stone fruit and tropical fruit on the nose along with a touch of spice. Fairly rich and smooth in the mouth and on the finish. Fenestra 2009 Grenache, Livermore. 50% of the fruit came from the estate vineyard. Medium-light ruby color, this featured red fruits, spice, and vanilla/oak aromas. Medium-light weight on the palate with moderate tannins. Fenestra 2007 “Tourvanillo,” Silvaspoons Vineyard, Lodi. 47% Touriga, 22% Alvarelhão, 14% Malbec, 10% Tempranillo, 3% Tinto Cão, 2% Souzão, 2% Graciano. Medium color, showing plum and red berry fruit, earth, herbs, and vanilla/oak. Fairly big and structured with a firm tannic finish. Fenestra 2008 Tempranillo, Livermore. Medium-dark color, displaying bright plum and black cherry fruit, smoke, earth, and dried herbs. Very lively mouthfeel, with fine tannins on the finish, nice. Comments: As usual, Fenestra owner Lanny Replogle poured the wines, which were sourced from both Lodi’s Silvaspoons Vineyard and from Livermore Valley. For the second straight year, their Livermore Tempranillo was my favorite. Folin 2008 Tempranillo, Folin Vineyard, Rogue Valley, Oregon. About 30% new oak, two years in barrel, one year in bottle. Medium-dark color, with black cherry and plum, earth, and spice aromas. Medium-rich on the palate with a tannic finish, nice. Folin 2008 Tempranillo, “Reserve,” Folin Vineyard, Rogue Valley, Oregon. 100% new oak, three years in barrel. Similar aromatics as the first bottling but more intense and with some well-integrated vanilla/oak notes. Richer mouthfeel with big, chewy tannins. Comments: Folin is one of the few American producers using Vino-Lok glass closures for their wines. Both Tempranillos were big, tannic wines, with the basic bottling being my favorite of the two. Forlorn Hope 2010 Torrontés, “La Gitana,” Silvaspoons Vineyard, Alta Mesa. Light straw color, with ripe stone fruit aromas plus a light floral scent. Medium-rich mouthfeel with nice acidic zip on the finish. Not overly perfumey as this variety can tend to be, this was very nice, probably the best California Torrontés I’ve tasted. Forlorn Hope 2010 Verdelho, “Que Saudade,” DeWitt Vineyard, Amador County. Very light color, this showed leesy tropical fruit and spice on the nose. Richer than the Torrontés, with a viscous feel on the finish. Forlorn Hope 2007 “Mil Amores,” DeWitt Vineyard, Amador County. A field blend of Touriga Nacional, Tinta Roriz, Tinta Cão, and Tinta Amarella. Medium purple color, featuring earthy and minerally plum and black cherry, along with a peppery note. Medium-bodied and lively, with moderate tannins. Forlorn Hope 2010 Alvarelhão, “Suspiro del Moro,” Silvaspoons Vineyard, Alta Mesa. Medium color, with very floral aromas along with plum, earth, and spice. Medium weight on the palate with a bigger structure than the “Mil Amores,” this was quite distinctive and should age well, quite nice. Forlorn Hope 2010 Gewürztraminer, “The Faufreluches,” Adam and Eve Vineyard, Russian River Valley. Fermented for two weeks on the skins. Very light orange color, displaying lychee and citrus fruit along with floral undertones and a touch of spice. Great acidity and a slight tannic bite on the finish. Not exactly an Iberian grape variety but nice wine! Comments: Forlorn Hope’s Matthew Rorick once again poured his wines, and again they were among they were impressive. The wines have no water or acid additions and only older barrels are used for aging. Jeremy 2011 Albariño, Lodi. Very light color, with somewhat shy aromas of stone fruit, pear, and spice. Medium-bodied with a lively mouthfeel and finish, nice. Jeremy 2009 Tempranillo, Amador County. Medium color, with ripe plum and blueberry fruit, smoke, and vanilla/oak. Rich and smooth on the palate, with moderate tannins. Comments: This was the second straight year that Jeremy’s wines have been very good. Kenneth Volk 2011 Albariño, Riverbench Vineyard, Santa Maria Valley. Very light color, with pear and stone fruit aromas plus a slight floral note. Medium weight on the palate with a fairly smooth finish. Kenneth Volk 2011 Malvasia Bianca, San Bernabe Vineyard, Monterey County. Very light color, this featured scents of lychee and stone fruit, spice, plus a perfumed floral component. Medium-bodied with juicy acidity with a clean, refreshing finish, nice. Kenneth Volk 2010 Verdelho, Pomar Junction Vineyard, Paso Robles. Very light straw color, showing tropical fruit, pepper, and spice notes. Moderately rich mouthfeel with a touch of bitterness on the finish. Kenneth Volk 2011 Torrontés, Silvaspoons Vineyard, Alta Mesa. Very light color, this had upfront floral aromas along with ripe stone fruit. Fairly big on the palate with a smooth finish. Kenneth Volk 2009 Touriga, Pomar Junction Vineyard, Paso Robles. Medium color, displaying floral red fruits, earth, and spicy oak. Medium-bodied, this had a round mouthfeel with milder tannins. Kenneth Volk 2009 Mourvèdre, Enz Vineyard, Lime Kiln Valley. From 80+ year-old, head-trained vines. Medium color, this showed earth and lots of black pepper, plum and black cherry fruit, and a floral note. More structured, with a big but lively mouthfeel and grippy tannins. An intriguing wine that should smooth out with some bottle age, nice. Comments: A long-time champion of less-common grape varieties in California, it was great to see Ken Volk pour his Iberian variety wines at TAPAS. Longoria 2011 Albariño, Clover Creek Vineyard, Santa Ynez Valley. Made entirely in stainless steel. Very light color, with apple, grapefruit, and the slightly briny note that’s not unusual in this variety. Medium-light bodied and lively with a clean finish. Longoria 2009 Tempranillo, Clover Creek Vineyard, Santa Ynez Valley. 95% Tempranillo, 3% Syrah, aged entirely in American oak, about 30% new. Medium color, displaying bright red fruit aromas, plus earth, smoke, and a touch of vanilla/oak. Medium-bodied with a vibrant acidity in the mouth, this finished with moderately grippy tannins, nice. Comments: Rick Longoria poured his wines, which were once again some of the standouts of the event. Pierce Ranch 2010 Albariño, San Antonio Valley. Very light color, this showed stone fruit and citrus aromas with a minerally note. Medium-light weight on the palate with a fairly smooth mouthfeel and finish. Pierce Ranch 2010 Verdelho, San Antonio Valley. Light color, featuring pear and lees on the nose plus some floral notes. More body than the Albariño, with a long, flavorful finish, note. Pierce Ranch 2009 Albariño, “Sur Lie,” San Antonio Valley. Light color, with a significant lees component in the aromas along with nectarine fruit. Richer and creamier in the mouth than the regular Albariño bottling, with a smooth finish. Pierce Ranch 2007 Tinto Cão, San Antonio Valley. Medium-dark color, displaying tobacco/dried herb notes upfront, with red fruits, earth, and spice in support. Medium-bodied with moderate tannins. Pierce Ranch 2008 Tempranillo, San Antonio Valley. Medium-dark color, this had earthy plum and darker fruit aromas, tobacco, earth, and touches of pepper and vanilla/oak. Bigger structure with a more grippy tannic finish. Pierce Ranch 2008 Touriga, San Antonio Valley. MostlyTouriga Nacional with some Touriga Franca. Medium-dark color, with floral red fruit, earth, and a dash of sweet oak. Medium-full bodied with a lively mouthfeel and youthful tannins, nice. Pierce Ranch 2009 “Cosecheiro,” San Antonio Valley. Not yet released, the 2009 vintage is mostly Touriga along with Tempranillo and Graciano. Medium-dark color, showing black cherry and plum, smoke, spice, and vanilla/oak on the nose. Big and structured, this finished with chewy tannins that will need time in the bottle. Comments: All of the fruit for these wines was sourced from the Pierce Ranch estate vineyard in the San Antonio Valley of southern Monterey County. These have been solid and consistent wines at the TAPAS events. Quinta Cruz 2011 Verdelho, Silvaspoons Vineyard, Alta Mesa. Very light color, with leesy peach and nectarine aromas along with a touch of spice. Medium weight with lively acidity and finish, nice. Quinta Cruz 2010 Tempranillo, Pierce Ranch, San Antonio Valley. Medium color, featuring ripe plum, earth, and undertones of vanilla/oak. This was medium-light bodied with a moderately tannic finish. Quinta Cruz 2008 Tempranillo, “Reserve,” Pierce Ranch, San Antonio Valley. Small amounts of Touriga and Graciano blended in. Less fruit-forward than the previous wine, with earth and leather notes upfront, along with black cherry, smoke, and dried herb notes. Medium-bodied with more structure and bigger tannins. Quinta Cruz 2009 Touriga, Pierce Ranch, San Antonio Valley. 82% Touriga Nacional and 18% Touriga Franca. Medium-dark color, with floral and earthy dark berry fruit plus a touch of spice. Medium weight on the palate with fairly grippy tannins that sneak in on the finish, nice. Quinta Cruz 2009 Graciano, Bokisch Vineyard, Mokelumne River. Medium-dark color, displaying a more earthy character along with plum and darker berry fruit and baking spice. Bigger-bodied and firmly tannic. This could be quite good given more bottle age. Quinta Cruz 2009 Souzão, Silvaspoons Vineyard, Alta Mesa. Medium-dark color, this was more fruit-forward while also showing some pepper and spice notes. Big and structured, this had a chewy tannic finish. 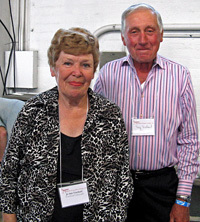 Comments: The sister winery of Santa Cruz Mountains Vineyard, Quinta Cruz once again presented a strong group of wines. 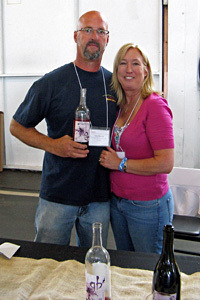 Winemaker Jeff Emery was on hand once again to pour his wines. St. Amant 2011 “Miss Independent” Verdelho, Amador County. Light color, with ripe stone fruit aromas along with slight floral and herb notes. Medium weight and fairly smooth on the palate, with a clean finish, nice. St. Amant 2010 “The Old Soldier” Touriga, Amador County. Medium-dark color, this had earthy and leathery notes upfront, along with darker berry fruit, flowers, and lots of spice. Medium-bodied with moderate tannins. St. Amant 2010 Souzão, Amador County. Medium-dark color, displaying earthy plum and blueberry aromas along with herbs and a touch of pepper. Fuller-bodied with a grippy tannic finish. St. Amant 2008 “The Road Less Traveled” Tempranillo, Amador County. Medium color, this featured more fruit-forward black cherry and plum, plus tobacco, smoke, and vanilla/oak on the nose. Big and structured, with a firm tannic bite on the finish. taste St. Amant’s Port-style bottlings, which are always outstanding. The wines I did taste were very good though. Six Sigma 2007 Tempranillo, Lake County. Sourced entirely from the estate Diamond Mine Vineyard, aged in 100% new French oak. Medium color, with earthy dark fruit, spice, and vanilla/oak notes. Medium-bodied with fairly big tannins on the finish. Comments: I hadn’t tasted the Six Sigma Tempranillo in a few years. Lake County seems like it may be a promising spot for this variety. Truchard 2008 Tempranillo, Carneros, Napa Valley. Medium color, featuring black cherry, spice, dried herb, and mineral components on the nose. Medium-bodied and very lively on the palate, with refined tannins on the finish. Perhaps the most elegant Tempranillo I tasted at this event, very nice. Truchard 2005 Tempranillo, Carneros, Napa Valley. Medium color, this displayed more pronounced herb/tobacco aromas along with higher-toned red fruits and earth. Lighter-bodied than the 2008, this had nicely resolving tannins. Comments: As they usually do, Truchard generously poured one of their older Tempranillos. Their current bottling may be the best of their younger ones that I’ve tasted yet. Tempranillo was planted at their Carneros property in 1998. Verdad 2011 Grenache Rosé, Santa Ynez Valley. 50% destemmed and left on the skins overnight before pressing and 50% whole-cluster pressed, fermented in stainless steel. Light pink, with minerally red fruit aromas along with notes of flowers and herbs. Clean and lively mouthfeel with a touch of tannin on the crisp finish, nice. Verdad 2011 Albariño, Paragon Vineyard, Edna Valley. Made in neutral oak. Light color, showing citrus and stone fruit along with a leesy note. Rounder on the palate but with a fresh, clean finish. Verdad 2011 Albariño, Sawyer Lindquist Vineyard, Edna Valley. Made in 50% stainless steel and 50% neutral oak. Light straw color, this displayed bright citrus and mineral aromas with a slight floral note. Livelier acidity in the mouth than the Paragon bottling, with a crisp finish, nice. Verdad 2009 Tempranillo, Santa Ynez Valley. 76% Tempranillo from Ibarra-Young Vineyard, 12% Grenache from Purisima Mountain, 12% Syrah from Bien Nacido, aged in 35% new Hungarian oak. Medium color, with smoky plum fruit, minerals, and spicy oak on the nose. Medium-bodied with a fairly smooth mouthfeel and moderate tannins. Verdad 2009 Tempranillo, Sawyer Lindquist Vineyard, Edna Valley. Aged in 35% new Hungarian oak. Less fruit-forward than the SYV bottling, this showed more minerally, earthy, and herbal character along with red fruits and hints of spice and oak. Medium weight on the palate with good structure for aging, nice. 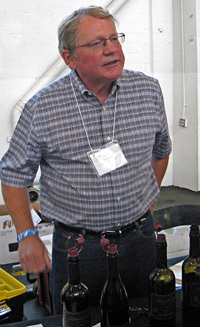 Comments: Bob Lindquist poured the Verdad wines, and he presented one of the strongest line-ups at the TAPAS tasting. Viña Castellano 2006 “Abuelita,” Sierra Foothills. 60% Cabernet Franc, 14% Tempranillo, 13% Syrah, 13% Grenache. Medium color, with red berry and plum fruit with some spice and oak notes. Medium-bodied with moderate tannins. Would not have guessed this wine had that much of a Cab Franc component. Viña Castellano 2006 Monastrell, Sierra Foothills. 100% Monastrell. Medium-light color, this displayed plum, herb, and pepper aromas. Medium-light weight on the palate with a grippy tannic finish. Viña Castellano 2006 Tempranillo, Sierra Foothills. Medium color, showing ripe black cherry, spice, and vanilla oak on the nose. Medium-bodied with a big, tannic structure. Comments: All of the Viña Castellano wines come from their estate vineyard near Auburn.